Over the next decade, a confluence of factors will give rise to expansion of the global market for gastric cancer therapies. Despite a reduction in the number of gastric cancer cases in the United States, aging populations are predicted to contribute to an increase in other nations. Also, due to the much higher incidence of gastric cancer in Japan compared to Western markets, the Japanese are more likely to be diagnosed with unresectable late-stage disease. In addition to these factors, the entry of new biologic therapies will have an impact on the global gastric cancer market. 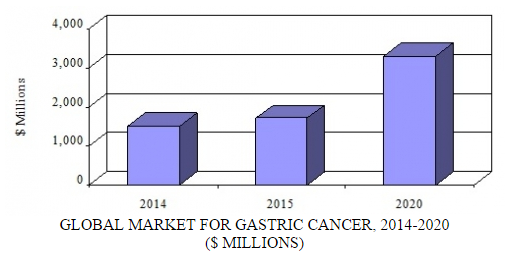 Globally, the market for gastric cancer therapies is valued at $1.7 billion. BCC Research projects this market to nearly double by 2020, reaching $3.3 billion with a compound annual growth rate (CAGR) of 14% for the period 2015–2020. This projected exponential growth is based on global incidence, surgery costs, and drug treatment costs. According to the American Society of Clinical Oncology, the total mean monthly cost of care for a newly diagnosed gastric cancer patient for the first year (including hospitalization, doctor visits, laboratory fees, radiology, and drugs) is more than $10,600 per month—nearly $130,000 per year. A few targeted therapies for gastric cancer have recently been launched. These include Eli Lilly’s Cyramza (ramucirumab), which was approved in the United States last year. It is the only FDA-approved second-line treatment option for patients with advanced or metastatic gastric cancer. Targeted therapies are expensive, and will thus drive the market. A number of drugs in clinical development for gastric cancer are based on biomarkers such as HER2. These include Roche/Genentech/Chugai’s Perjeta (pertuzumab) and Kadcyla (ado-trastuzumab emtansine), both in Phase III development for gastric cancer. These agents are expected to drive the gastric cancer treatment market over the next few years. BCC Research projects Perjeta will have a CAGR of 29.9% from 2015–2020, with global sales increasing from $1.2 billion to $4.6 billion during the forecast period. Over the same time frame, Kadcyla will see a CAGR of 19.9%, with its global sales increasing to $1.8 billion by 2020, according to BCC Research’s projections. Kadcyla is expensive, with a monthly cost of $9,800, or about $94,000 for an average treatment. It is more than twice the price of Herceptin (trastuzumab; Genentech), which is about $4,500 per month. Perjeta goes for $6,000 per month. In China, the gastric cancer drug market is expected to reach $500 million this year. 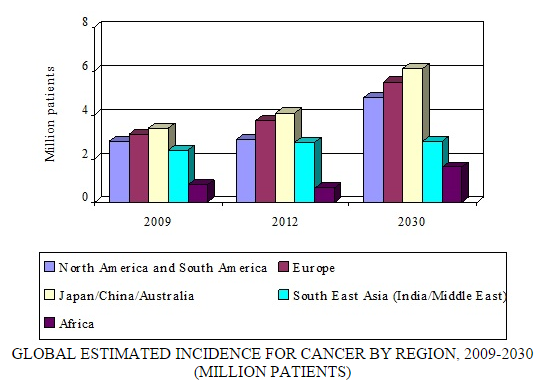 The incidence of gastric cancer in China is among the highest worldwide, surpassed only by Japan and Korea. China accounts for over 40% of all new gastric cancer cases in the world. Although not approved by the Chinese government for gastric cancer treatment, branded targeted therapies such as Erbitux (cetuximab; Eli Lilly), Herceptin, and Gleevec (imatinib; Novartis) are currently used off-label by Chinese oncologists for gastric cancer treatment. Some targeted therapies, including Herceptin, GlaxoSmithKline’s Tykerb (lapatinib), and Novartis’ Afinitor (everolimus), will be launched in China for treatment of gastric cancer by the end of BCC Research’s forecast period. In China, about 15% of gastric cancer patients are HER2-positive, so use of Herceptin to treat these patients may see a rise. Herceptin is experiencing particularly strong growth in Japan and emerging markets. Continued interest and uptake of Herceptin and other new biological therapies will increase significantly during the next five years. They are also the fastest-growing part of the United States’ prescription drug bill, with sales consistently increasing at nearly double the rate of growth for traditional pharmaceuticals. By 2030, BCC Research predicts the global cancer burden to nearly double, growing to 21.4 million cases and 13.2 million deaths. Today, gastric cancer is the fifth most common cancer in the world, with around 22,000 diagnoses expected this year in the United States. Cancer treatment options are becoming more accessible and affordable in various countries around the world. These factors, along with better diagnostic approaches, are expected to help foster growth in the gastric cancer diagnostics, screening, and therapeutics market. Newer therapies will overtake conventional cancer treatments and propel sales of the global cancer therapies market to $111 billion by 2019. As these newer drugs enter the market and the demand for better oncology drugs grows, healthcare systems worldwide will increasingly rely on cancer screening and detection to offer more efficacious treatment options.